Talgo Trains of Spain has recently concluded three trial runs of its special trains on the Moradabad-Bareli, Mathura- Palwal and Mumbai-Delhi routes, without making any change in the Indian tracks. Subrat Nath, Director — India and Asia Pacific, Talgo takes a few questions from Vidyottama Sharma. What is the specialty of these trains? What makes Talgo trains special is the rich history and 75 years of experience in designing railway rolling stock that has made the company and its technology recognizable on a global scale. Talgo was established in 1942 with a revolutionary concept of a light-weight and articulated train to improve passenger services of railway operators worldwide. Talgo’s key drivers are innovation, safety, and quality. Talgo trains have articulated bogies, lightweight shells with all aluminium coaches and a design that allows natural tilting of coaches, enabling it to negotiate curves at high speed. Because Talgo coaches are lighter, it enables them to achieve faster acceleration and deceleration and hence, reach destinations faster than conventional coaches. 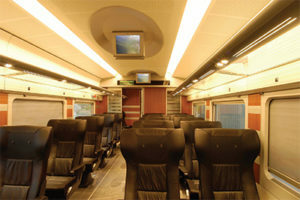 The light weight aerodynamic Talgo coaches are also very energy-efficient. Talgo trains are best in class in terms of energy consumption as they can save up to 30% of energy. Light weight Talgo coaches reduce maintenance of track as well as trains. Talgo trains will consume less energy, are environment-friendly, offer less maintenance for train and infrastructure, are safer than traditional coaches and are the most economical solution for giving a modern high speed service to passengers of Indian Railways. What is the technology that makes the Talgo coaches run on our existing tracks without changing them? Talgo trains are the most suitable option for reducing transit time for Indian Railways without investing in the track which has been successfully proven during the trial runs in India held last year. Because Talgo coaches weigh only 17 tonnes as compared with the conventional coaches currently in India which weigh close to 51 tonnes, Talgo coaches can accelerate faster than conventional coaches and hence, can clock a higher average speed. The natural tilting system also allows Talgo trains to run faster. Talgo wheel set with independent wheels and guided axles is very track-friendly. This reduces the force applied on the tracks while the trains are running on current Indian infrastructure. At the speed of 180 kmph, the lateral force on track was measured to be 0.39G whereas the limit is 1G . All these features make Talgo technology perfectly suited to run on Indian tracks without any additional investment needed to change them. Why and when did Talgo decide to enter India with these highspeed coaches? Which routes do you wish to introduce them on? India is a priority market for Talgo. We have been given to understand that in India you have to go under a tendering process for implementation of any project. Hence, the reason behind conducting the trials in India was first to demonstrate the Talgo technology to the government and also prove the concept. This would enable opening of the specifications for us to participate in a tender and compete on fair grounds. Another objective behind the trials was to make a series of compatibility tests with Indian infrastructure and also validate that Talgo train can reduce transit time on the existing infrastructure which was achieved during the Delhi-Mumbai run. The decision regarding the routes on which Talgo trains will be deployed is entirely dependent on the Indian Railways. They will choose the routes they think would benefit the most. What would be the mode of partnership/ operations? Are you in talks with the Indian government at any level? We are in talks with Indian Government at different levels to introduce Talgo trains in passenger operation and open to any proposal that Indian Railways may come out with. What are your plans about setting up a manufacturing unit in India? If you intend to do so, where would you want to set it up? India is a very important market for us and our long term goal is to manufacture semi-high speed and highspeed (bullet trains) Talgo coaches in the country under the government’s ‘Make in India’ umbrella. India is also an attractive market for us to set up a manufacturing unit because of the big pool of qualified engineers present in the market. We are very keen on producing locally as much as we can as this will help us reduce our manufacturing costs and maintain a competitive pricing structure as well as enable us to export Talgo coaches manufactured in India to other parts of the world. Which countries do you already have presence in? 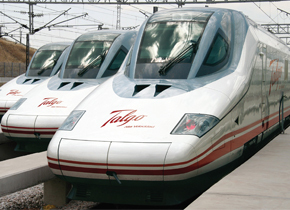 Talgo has been successfully adopted in several countries including Spain, France, Germany, Kazakhstan, Uzbekistan, Russia, Saudi Arabia and the United States. With the recent success in Kazakhstan for High Speed on existing infrastructure and the Mecca-Medina Very High Speed Rail Project in the Kingdom of Saudi Arabia, Talgo has consolidated its position as one of the leading rolling stock suppliers for High Speed Rail projects in the world. 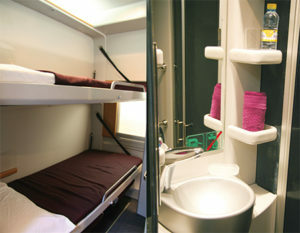 Since these are ultra-high speed technology trains, they would come at a premium cost. How would it be feasible to introduce them in India? Talgo understands railway projects fall under the larger social and national interest. This is one of the key reasons Talgo is interested in setting up a manufacturing plant in India, so that we can produce coaches locally and remain competitive in our price structure. We know that in order to be successful in India, we need to establish ourselves here. We need to produce as much locally as possible. We are open to either establishing a plant from scratch, or partnering with Indian Railways or a private player. How will these coaches benefit India? During our Delhi Mumbai trials, we demonstrated that Talgo trains can run on an average speed of 105kmph on the existing infrastructure under similar conditions as that of the current Shatabdi trains running on the same route, clocking an average speed of only 75 km per hour. For any conventional train to run on a higher speed on those tracks there will be a minimum investment requirement of Rs 15 crore per km. It’s not only about the investment but also the time it will take for the up-gradation. This up-gradation can be done on few routes in 5 to 10 years but not all over India. Talgo technology can be implemented on all routes across India on an immediate basis. How many will you introduce in the first phase? Talgo will like to introduce four trains to start with on lease such that Indian Railways can use them for passenger services and gain experience till the time the tender for setting up the factory materialises.